Cultural: The Enlightenment philosophy desacralized the authority of the monarchy and the Catholic Church, and promoted a new society based on reason instead of traditions. Social: The emergence of an influential bourgeoisie which was formally part of the Third Estate (commoners) but had evolved into a caste with its own agenda and aspired to political equality with the clergy (First Estate) and the aristocracy (Second Estate). Financial: France's debt, aggravated by French involvement in the American Revolution, led Louis XVI to implement new taxations and to reduce privileges. Political: Louis XVI faced strong opposition from provincial parlements which were the spearheads of the privileged classes' resistance to royal reforms. Economic: The deregulation of the grain market, advocated by liberal economists, resulted in an increase in bread prices. In periods of bad harvests, it would lead to food scarcity which would prompt the masses to revolt. All these factors created a revolutionary atmosphere and a tricky situation for Louis XVI. In order to resolve the crisis, the king summoned the Estates-General in May 1789 and, as it came to an impasse, the representatives of the Third Estates formed a National Assembly, against the wishes of the king, signaling the outbreak of the French Revolution. The essence of the revolutionary situation which existed in France in the 1780s was the bankruptcy of the king, and hence the state. This economic crisis was due to the rapidly increasing costs of government and to the overwhelming costs incurred by fighting two major wars: the Seven Years' War and the American Revolutionary War. These costs could not be met from the usual sources of state revenue. Since the 1770s, several attempts by different ministers to introduce financial stability had failed. The taxation system was burdensome upon the middle class and the more prosperous peasants, given that the nobles were largely able to exempt themselves from it. As a result, there was "an insistent demand" for reform of these abuses of privilege, for an equitable means of taxation and for improved government processes. David Thomson argued that the bourgeoisie and peasantry had "something to lose, not merely something to gain" in their demands for a fairer society and this fear too was a major factor in the revolutionary situation. A growing number of the French citizenry had absorbed the ideas of "equality" and "freedom of the individual" as presented by Voltaire, Jean-Jacques Rousseau, Denis Diderot and other philosophers and social theorists of the Age of Enlightenment. The American Revolution demonstrated that it was plausible for Enlightenment ideas about how a government should be organized to actually be put into practice. Some American diplomats, like Benjamin Franklin and Thomas Jefferson, had lived in Paris, where they consorted freely with members of the French intellectual class. Furthermore, contact between American revolutionaries and the French troops who served in North America helped spread revolutionary ideas to the French people. The Third Estate (commoners) carrying the First (clergy) and Second Estate (nobility) on his back. The population of France in the 1780s was about 26 million, of whom 21 million lived in agriculture. Few of these owned enough land to support a family and most were forced to take on extra work as poorly paid labourers on larger farms. There were regional differences but, by and large, French peasants were generally better off than those in countries like Russia or Poland. Even so, hunger was a daily problem which became critical in years of poor harvest and the condition of most French peasants was poor. The fundamental issue of poverty was aggravated by social inequality as all peasants were liable to pay taxes, from which the nobility could claim immunity, and feudal dues payable to a local seigneur or lord. Similarly, the destination of tithes which the peasants were obliged to pay to their local churches was a cause of grievance as it was known that the majority of parish priests were poor and the contribution was being paid to an aristocratic, and usually absentee, abbot. The clergy numbered about 100,000 and yet they owned 10% of the land. The Catholic Church maintained a rigid hierarchy as abbots and bishops were all members of the nobility and canons were all members of wealthy bourgeois families. As an institution, it was both rich and powerful. As with the nobility, it paid no taxes and merely contributed a grant to the state every five years, the amount of which was self-determined. The upper echelons of the clergy had considerable influence over government policy. Dislike of the nobility was especially intense. 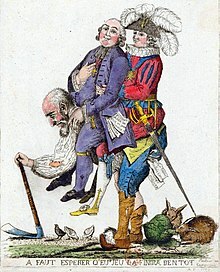 Successive French kings and their ministers had tried with limited success to suppress the power of the nobles but, in the last quarter of the 18th century, "the aristocracy were beginning once again to tighten their hold on the machinery of government". France in 1787, although it faced some difficulties, was one of the most economically capable nations of Europe. The French population exceeded 28 million; of Europe's 178 to 188 millions, only Imperial Russia had a greater population (37 to 41 million). France was also among the most urbanized countries of Europe, the population of Paris was second only to that of London (approximately 500,000 vs. 800,000), and six of Europe's 35 larger cities were French. Other measures confirm France's inherent strength. France had 5.3 million of Europe's approximately 30 million male peasants. Its area under cultivation, productivity per unit area, level of industrialization, and gross national product  (about 14% of the continental European product, excluding Russia, and 6% to 10% above the level elsewhere in Europe ) all placed France near the very top of the scale. In short, while it may have lagged slightly behind the Low Countries, and possibly Switzerland, in per capita wealth, the sheer size of the French economy made it the premier economic power of continental Europe. Louis XV and his ministers were deeply unhappy about Britain's victory in the Seven Years' War and, in the years following the Treaty of Paris, they began drawing up a long-term plan that would involve constructing a larger navy and building an anti-British coalition of allies. In theory, this would eventually lead to a war of revenge and see France regain its colonies from Britain. In practice, it resulted in a mountain of debts. On the advice of, what many believed was, his mistress, the Marquise de Pompadour, the king supported the policy of fiscal justice designed by d'Arnouville. In order to finance the budget deficit, which amounted to 100 million livres in 1745, Machault d'Arnouville created a tax of 5% on all revenues (the vingtième), a measure that affected the privileged classes as well as the rest of the population. Still, expenditures outpaced revenues. Ultimately, Louis XV failed to overcome these fiscal problems, mainly because he was incapable of harmonizing the conflicting parties at court and arriving at coherent economic policies. Worse, Louis seemed to be aware of the anti-monarchist forces that were threatening his family's rule, yet he failed to do anything to stop them. Under the new king, Louis XVI, radical financial reforms by his ministers, Turgot and Malesherbes, angered the nobles and were blocked by the parlements who insisted that the king did not have the legal right to levy new taxes. So, in 1776, Turgot was dismissed and Malesherbes resigned. They were replaced by Jacques Necker, who supported the American Revolution and proceeded with a policy of taking large international loans instead of raising taxes. France sent Rochambeau, Lafayette and de Grasse, along with large land and naval forces, to help the Americans. French aid proved decisive in forcing the main British army to surrender at the Battle of Yorktown in 1781. The Americans gained their independence, and the war ministry rebuilt the French army. However, the British sank the main French fleet in 1782, and France gained little, except for the colonies of Tobago and Senegal, from the Treaty of Paris (1783) that concluded the war. The war cost 1.066 million French livres, a huge sum, that was financed by new loans at high interest rates, but no new taxes were imposed. Necker concealed the crisis from the public by explaining only that ordinary revenues exceeded ordinary expenses, and by not mentioning the loans at all. When Necker's tax policy failed miserably, Louis dismissed him, and replaced him, in 1783, with Charles Alexandre de Calonne, who increased public spending in an attempt to "buy" the country's way out of debt. This policy also failed; therefore, Louis convened the Assembly of Notables in 1787 to discuss a revolutionary new fiscal reform proposed by Calonne. When the nobles were told the extent of the debt, they were shocked; however, the shock did not motivate them to rally behind the plan – but to reject it. This negative turn of events signaled to Louis that he had lost the ability to rule as an absolute monarch, and he fell into depression. Edmund Burke, no friend of the revolution, wrote in 1790: "the public, whether represented by a monarch or by a senate, can pledge nothing but the public estate; and it can have no public estate except in what it derives from a just and proportioned imposition upon the citizens at large." Because the nobles successfully defended their privileges, the king of France lacked the means to impose a "just and proportioned" tax. The desire to do so led directly to the decision in 1788 to call the Estates-General into session. The financial strain of servicing old debt and the excesses of the current royal court caused dissatisfaction with the monarchy, contributed to national unrest, and culminated in the French Revolution of 1789. Louis XVI, his ministers, and the widespread French nobility had become immensely unpopular. This was a consequence of the fact that peasants and, to a lesser extent, the poor and those aspiring to be bourgeoisie, were burdened with ruinously high taxes levied to support a wealthy monarchy, along with aristocrats and their sumptuous, often gluttonous lifestyles. Hôtel de la gabelle (House of the Salt Tax) in Bernay, Eure, Upper Normandy, built in 1750 by Bréant and Ange-Jacques Gabriel. Peasants and nobles alike were required to pay one-tenth of their income or produce to the church (the tithe). Peasants paid a land tax to the state (the taille), a 5% property tax (the vingtième). All paid a tax on the number of people in the family (capitation), depending on the status of the taxpayer (from poor to prince). Further royal and seigneurial obligations might be paid in several ways: in labor (the corvée), in kind, or, rarely, in coin. Peasants were also obligated to their landlords for: rent in cash (the cens), a payment related to their amount of annual production (the champart), and taxes on the use of the nobles' mills, wine-presses, and bakeries (the banalités). In good times, the taxes were burdensome; in harsh times, they were devastating. After a less-than-fulsome harvest, people would starve to death during the winter. Tax collection was farmed out (privatized) to "fermiers", through a system of public bidding. Public officials bought their positions from the king, sometimes on an annual basis, sometimes in perpetuity. Often an additional tax, called "paulette" was paid by the holders of an office to upgrade their position to one that could be passed along as an inheritance. Naturally, holders of these offices tried to reimburse themselves by milking taxpayers as hard as possible. For instance, in a civil lawsuit, judges required that both parties pay for the costs of the trial (called the épices, the spices); this, effectively, put justice out of the reach of all but the wealthy. The system also exempted the nobles and the clergy from taxes (with the exception of a modest quit-rent, an ad valorem tax on land). The tax burden, therefore, devolved to the peasants, wage-earners, and the professional and business classes, also known as the third estate. Further, people from less-privileged walks of life were blocked from acquiring even petty positions of power in the regime. This caused further resentment. During the reigns of Louis XV (1715–1774) and Louis XVI (1774–1792), several ministers, most notably Turgot and Necker, proposed revisions to the French tax system so as to include the nobles as taxpayers, but these proposals were not adopted because of resistance from the parlements (provincial courts of appeal). Members of these courts bought their positions from the king, as well as the right to transfer their positions hereditarily through payment of an annual fee, the paulette. Membership in such courts, or appointment to other public positions, often led to elevation to the nobility (the so-called Nobles of the Robe, as distinguished from the nobility of ancestral military origin, the Nobles of the Sword.) While these two categories of nobles were often at odds, they both sought to retain their privileges. The need to raise taxes placed the king at odds with the nobles and the upper bourgeoisie, he appointed as his finance ministers, "rising men" (to use François Mignet's insightful term), usually of non-noble origin. These commoners, Turgot, Chrétien de Malesherbes, and Jacques Necker lobbied for reforms in taxation and other moves toward moderation, such as Necker's attempts to reduce the lavishness of the king's court. Each one failed. Instead, the "Parkinson's law" of bureaucratic overextended waste prevailed, to the detriment of the gentry and other non-seigneurial classes. In contrast, Charles Alexandre de Calonne, appointed finance minister in 1783, restored lavish spending reminiscent of the age of Louis XIV. By the time Calonne brought together the Assembly of Notables on 22 February 1787 to address the financial situation, France had reached a state of virtual bankruptcy; no one would lend the king money sufficient to meet the expenses of the royal court and the government. According to Mignet, the loans amounted to 1.64 billion livres, and the annual deficit was 140 millions. Calonne was succeeded by his chief critic, Étienne Charles de Loménie de Brienne, archbishop of Sens, but the fundamental situation was unchanged: the government had no credit. To address this, the Assembly of Notables sanctioned "the establishment of provincial assemblies, regulation of the corn trade, abolition of corvées, and a new stamp tax", but the assembly dispersed on 25 May 1787 without actually installing a longer-term program with prospects for success. H. F. Helmolt argued that the issue was not so much the debt per se, but the way the debt was refracted through the lens of Enlightenment principles and the increasing power of third-estate creditors, that is, commoners who held the government's paper. Properly speaking, the people ought to have been accustomed to the fact that the French government did not fulfill its financial obligations, for since the time of Henry IV, that is, within two centuries, it had failed to meet its obligations fifty-six times. In earlier days such catastrophes had not been announced and publicly discussed. Now all France, which for two generations had been worked upon by the party of rationalism, shared the outcry against the financial situation. The struggle with the parlements and nobles to enact reformist measures displayed the extent of the disintegration of the Ancien Régime. In short order, Protestants regained their rights, and Louis XVI was pressured to produce an annual disclosure of the state of his finances. He also pledged to reconvene the Estates-General within five years. Despite the pretense that France operated under an absolute monarchy, it became clear that the royal government could not successfully implement the changes it desired without the consent of the nobility. The financial crisis had become a political crisis as well, and the French Revolution loomed just beyond the horizon. by Nicolas de La Mare (1707): under the Ancien Régime, the police regulated price, quality and supply of bread. In Ancien Régime France, bread was the main source of food for poor peasants and as the king was required to ensure the food supply of his subjects, the king was affectionately nicknamed le premier boulanger du royaume ("prime baker of the kingdom"). During this period, the role of the royal police was far more involved than simply upholding the law. Police held responsibility over many systems in society, even street sweeping, it also exercised a strict control over food supply. In order to maintain social order, the grain market was submitted to harsh rules to ensure the quality of the bread and its availability at all time and for the entire population. Grain merchants were viewed with suspicion, they were called "the most cruel enemies of the people" because they were suspected to mix flour with other products (such as chalk or crushed bones) or to hoard grains to raise artificially the prices of this vital commodity. The Ancien Régime favoured a "moral economy" where cupidity was moderated by strict regulations. The police controlled the purity of the flour and made sure that no one would hide grains to drive up prices. Food scarcity was common in the 18th century, but the grain police would forbid exportations from regions facing bad harvests and would import grain from regions enjoying overproduction. It could also force a merchant to dump the price of his flour (he was later compensated for his loss in times of abundance). During the Age of Enlightenment, the physiocrat school of economy emerged. The physiocrats, or économistes as they called themselves, had a great impact on Turgot, Louis XVI's Controller-General of Finances. Their opinion on what government economic policy should be was summarized in the term Vincent de Gournay laid claim to: "laissez faire, laissez passer", meaning leave it alone and let it pass, also known as the "invisible hand" notion. Turgot passionately defended Gournay's belief in "laissez-faire" economic principles in his writing "Éloge de Gournay". Accordingly, Turgot abolished police regulations and established free trade in grain on 13 September 1774. During the period before the spring harvest of 1775, the cereal reserves were exhausted while new crops had not yet arrived. In spring 1775, famine arose in this new context: before Turgot's edict, every region faced its own shortages, so that some would have suffered a genuine famine while others would have been totally spared and supplied through stable prices; a royal intervention would have been requested, and without a doubt obtained, to assure the supply of the regions most affected. With liberalization, owners of grain started to speculate by storing grain. They also tend to buy en masse in areas of good harvests to sell in areas of bad harvests where profits could be greater, causing significant price increases and shortages all over and affecting more people more quickly. Changes to grain and bread supply had serious implications, and was met with disorder. This conflict was known as the Flour War of 1775. Reports from those that controlled the flow of grain stated there were problems with the grain harvest which caused shortages and less grain availability. The price of grain also increased, and became hard for some to afford. News of a grain shortage was met with skepticism and frustration rose from higher prices. Those in opposition of the reform rioted, and seized grain that came in on shipments. They offered what they felt was the "just price" for it. This demonstrated a way in which the people took some power back into their own hands. This practice was known as "taxation populaire", or popular taxation. While there were documented efforts to deal with the grain shortage problems, such as increasing shipments from foreign countries, beliefs that the famine was intentionally orchestrated by Louis XVI, through the "Pacte de Famine", emerged. Turgot repressed the riots and restored controls over the grain market. The idea of free trade of grain was discredited and the economic experiment distanced the masses from the government in Versailles. The Flour War can be seen as a prelude to the French Revolution. The fear of famine became an ever-present dread for the lower strata of the Third Estate, and rumors of the "Pacte de Famine" to starve the poor were still rampant and readily believed. Mere rumors of food shortage led to the Réveillon riots in April 1789. Rumors of a plot aiming to destroy wheat crops in order to starve the population provoked the Great Fear in the summer of 1789. The hunger and despair of the Parisian women was also the original impetus for the Women's March on Versailles in October 1789, they wanted not just one meal but the assurance that bread would once again be plentiful and cheap. The two years prior to the revolution (1788–89) saw meager harvests and harsh winters, possibly because of a strong El Niño cycle caused by the 1783 Laki eruption in Iceland. The Little Ice Age also affected farmers' choices of crops to plant; in other parts of Europe, peasant farmers had adopted the potato as its staple crop. The potato had been introduced to France during the 16th century and despite resistance had largely supplanted the turnip and rutabaga in France. Despite encouragement from individuals like Antoine Parmentier and Louis XVI, grain was still a much more popular staple crop in France. This was partially because potatoes were seen as more difficult to transport and store than grain. ^ James B. Collins, "The Ancien Régime and the French Revolution", 2002, p.23 : "The Physiocrats denounced government interference in the economy, and sponsored free market ideas. These ideas had some currency in France in the 1760s: the government briefly created a free market in grain and abolished the state monopoly of the West India Company in 1769. The free market in grain led to riots (...) Turgot's deregulation of the grain trade, enacted on the eve of a widespread grain shortage, led to riots so severe they are known as the Flour War." ^ Peter McPhee (2015). The French Revolution. Melbourne U. p. 34. ISBN 978-0522866971. ^ David Thomson, Europe Since Napoleon (1957) pp. 24–25. ^ Vincenzo Ferrone, The Enlightenment: History of an Idea (Princeton UP, 2015). ^ a b Hibbert, p. 30. ^ Bernard Lepetit, The Pre-industrial Urban System: France 1740–1840 (Cambridge UP, 1994). ^ Ralph W. Greenlaw, ed., The economic origins of the French revolution: poverty or prosperity? (Heath, 1958). ^ John Shovlin (2007). The Political Economy of Virtue: Luxury, Patriotism, and the Origins of the French Revolution. Cornell UP. p. 9. ISBN 978-0801474187. ^ Eugene Nelson White, "The French Revolution and the politics of government finance, 1770–1815." Journal of Economic History 55#2 (1995): 227–55. ^ Stacy Schiff (2006). A Great Improvisation: Franklin, France, and the Birth of America. Macmillan. p. 5. ISBN 978-1429907996. ^ The French Revolution. Discoverfrance.net. Retrieved on 2011-11-18. ^ Peter Mathias and Patrick O'Brien, "Taxation in Britain and France, 1715–1810. A comparison of the social and economic incidence of taxes collected for the central governments." Journal of European Economic History 5#3 (1976): 601+. ^ The taille was meant to pay for the war effort; nobility was exempted as they considered their physical participation in the war as a "blood tax". ^ Louis XV introduced a fixed remuneration scheme for tax collectors in 1769. ^ The épices were no bribes, as they did not go to the judge directly, but to a common fund, and served to pay for the costs incurred by the judges, who had to remunerate their auxiliaries – see Albert N. Hamscher, The Parlement of Paris after the Fronde 1653–1673, p. 66. ^ Robert D. Harris, Necker: reform statesman of the Ancien Régime (U of California Press, 1979). ^ Gilbert Faccarello, "Galiani, Necker and Turgot. A debate on economic reform and policy in 18th Century France." History of Economic Thought 1.3 (1994): 519–50. ^ Eugene Nelson White, "Was there a solution to the Ancien Régime's Financial Dilemma?." Journal of Economic History 49.03 (1989): 545–68. ^ a b H.F. Helmolt, History of the World, Volume VII, Dodd Mead 1902, pp. 120–21. ^ Bourguinat, Nicolas (January 1997). "L'État et les violences frumentaires en France sous la Restauration et la Monarchie de Juillet". Ruralia (1). Retrieved 26 February 2014. ^ Richard H. Grove (1998). "Global Impact of the 1789–93 El Niño". Nature. 393 (6683): 318–19. doi:10.1038/30636. Campbell, Peter, and Peter McPhee. "Rethinking the origins of the French Revolution." in Peter McPhee, ed., A Companion to the French Revolution (2013) pp. 1–23. Campbell, Peter R., ed. The Origins of the French Revolution (2005). Doyle, William. Origins of the French Revolution (2001). Hibbert, Christopher (1980). The French Revolution. London: Penguin. ISBN 978-0140049459. Thomson, David (1957). Europe Since Napoleon. London: Longmans.